I’m new to this – how and why does anamorphic 4K cinema deliver higher performance and how do I watch 16:9 TV content on that bigger screen? Should I use the Paladin DCR or standard Paladin lens? Both models employ the highest performance optical technology available for their respective resolutions. For native 4K/4096 projectors (all Sony and JVC 4K/4096 models in 2019) use the Paladin DCR. For native 4K/3840 projectors (especially projectors using DLP 4K XPR microdisplay panels) and other 16:9 native projectors such as from Digital Projection, Epson and Benq, use the Paladin. However, note that many 4K/4096 models also have modes to use the standard Paladin as well, albeit with the lower pixel count and therefore lower detail and brightness compared to using the Paladin DCR. How do these lenses attach to the projector? How should they be cleaned? Panamorph lenses attach using the included XM2 steel attachment plate sandwiched between the projector and ceiling mount or attached to a shelf below the projector. What are the theater guidelines for best use of these anamorphic lenses? Panamorph lenses are the most recognized and recommended anamorphic projection lenses throughout the projection industry and high end enthusiast markets. 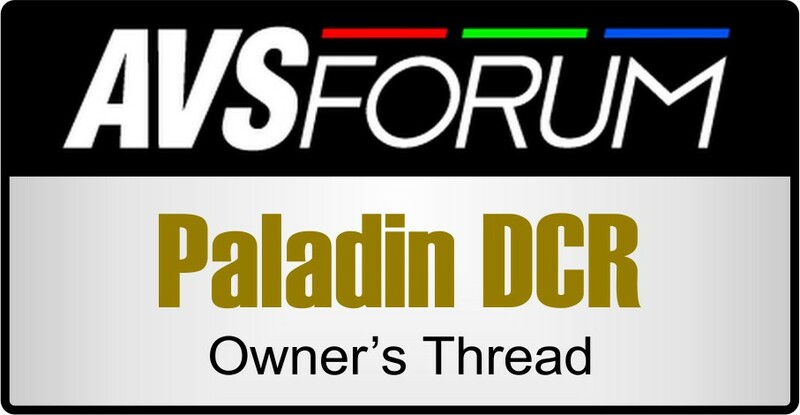 You can read many reviews and even ask for inputs from a vast number of people from new users to some of the foremost home theater experts at the AV Science Forum Paladin DCR Owner’s Thread. Will these lenses work with my specific projector model? Will I have to get a new lens if I get a new projector? For specific current projector model compatibility please go to the Lens Systems menu. if you do not see your model please contact us. Paladin and Paladin DCR lenses are largely future-proof with performance rated to true 8K resolution, meaning they will likely be the only lens you’ll need to buy for your theater at a specific projector format (ie 4K/3840/16:9 or 4K/4096/17:9 projectors). As long future projector models for your theater have the appropriate anamorphic modes it is highly likely you will just need, at most, a new mounting solution. We just installed a Paladin / Paladin DCR lens. Why doesn’t the image height quite fit my screen AND/OR why does the bottom or top have a curve to it? Paladin lenses provide aspect ratio adjustability. While displaying a movie with a known 2.4:1 aspect ratio, make sure you are using the correct projector anamorphic movie mode and that the image fills the width of the screen. Now adjust the Paladin lens tilt screws to angle the lens up or down. You will notice the image also shifts up or down but it will also very slightly change the image height and may also reduce strong curvature at the top or bottom. Then use the projector vertical shift to move the image back onto the screen. It may take a few iterations of these steps to fine tune the image geometry. Some projectors include geometry control. Please make sure any projector geometry adjustments are neutral before installing the Paladin lens and only make projector geometry adjustments after the above mechanical steps are completed (you may decide you do not need to make projector geometry adjustments). How do I buy a Panamorph lens either as a new dealer or for my own theater? I have an older Panamorph product. Will it work with new projectors? How do I mount it? Is there a repair service and/or are their replacement parts? LENS PERFORMANCE: Older Panamorph lens models such as the Phoenix, UH480, DC1 and CineVista will work with newer anamorphic-compatible projector models but are not recommended for projectors with true 4K resolvable pixels because the horizontal expansion technology of those lenses does not support that level of detail. In general it may be better to keep the older lens system with the older projector and go with the vertical compression technology of the Paladin and Paladin DCR for new projectors having true 4K and especially 8K resolvable pixels, using the Paladin DCR for 4K/4096 models to use the full width of those projectors (older lens models are only meant for using the 3840 width). MOUNTING SOLUTIONS: Older lens models were twice as heavy as the newer models and, especially if used with an ATH1 or ATH2 transport, required a heavy steel “AK” plate with specific hole patterns for multiple projectors. We no longer make attachment plate systems for mounting older lenses and transports to newer projectors. The new anamorphic-compatible projectors also have modes for watching 16:9 content without moving the lens so we no longer make transports either. If you want to mount an older lens to a newer projector without using a transport it is possible to use our XM2 Attachment Kit and then to modify the older lens bracket to permanently mount the lens to the XM2. If you still want to use an older lens with its existing transport we recommend building a block structure from the ceiling down to the front of the projector and then securing the ATH1/ATH2 with mounted lens to that structure. SERVICE AND REPAIR: While anamorphic lenses seldom need servicing other than typical cleaning, we no longer have parts for the older lenses and transport systems for repairs or maintenance since these were discontinued years ago. However, some ATH transports have been in service for over ten years and occasionally a common issue is for the transport motor to continue running after the lens reaches the non-motor end. There is a sensor emitter/detector in the small end of the transport which sends a beam toward the lens platform and is reflected back from a machined silver circle on that platform. Blowing out the sensor area with air and cleaning the silver circle on the platform often resolves this issue.